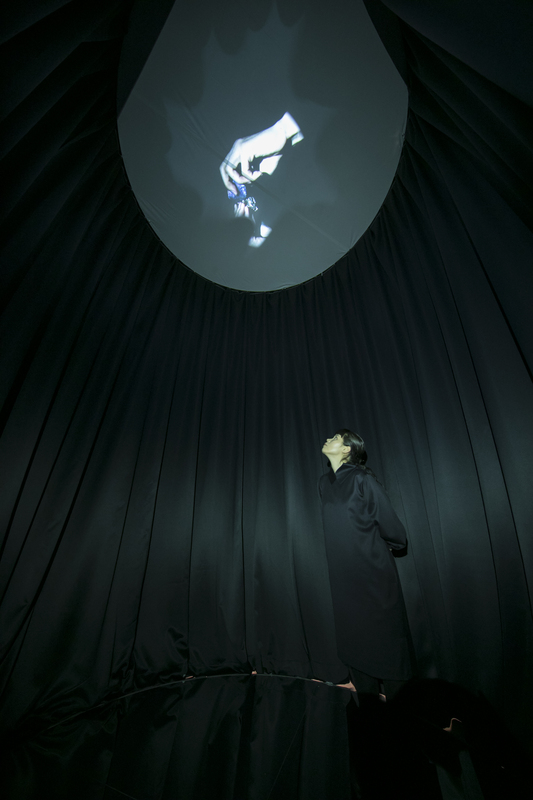 Born in 1992 and raised in Saitama Prefecture, contemporary artist Ana Scripcariu-Ochiai has presented her works at venues throughout the world, such as the Château de Chambord World Heritage site in France, the Art Exchange Exhibition at Daegu University in Korea, and the Zushi Art Festival. She is currently engaged in research on local festivals and rituals to create related artworks. 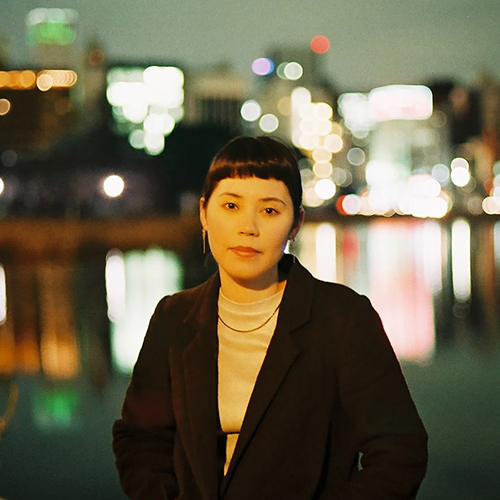 She graduated as the top student in the Oil Painting course at the Tokyo University of the Arts, and as valedictorian of Faculty of Fine Arts, in 2016. She is currently working towards her master’s degree at the university’s Graduate School of Fine Arts Global Art Practice course. 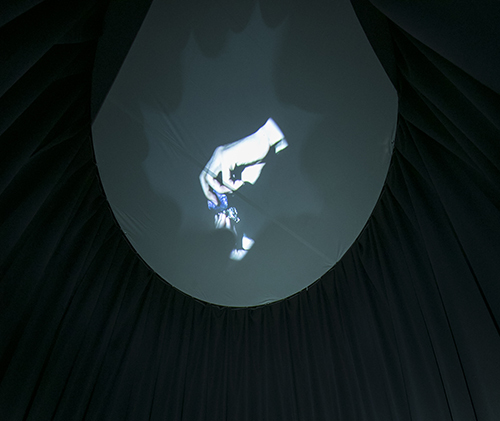 2018 / Installation / size: 3 m x 3 m x 12 m / materials: film, sound, mirrors, screens, black stage curtain. The primitive method of creating fire with flint served not only a practical purpose in Japan, but also to ward off evil, to cleanse, and for luck, and some still use it today. A single primitive act has gone beyond time and distance to give us diverse meanings. The interesting differences and similarities extend beyond borders of ethnicity and age, and beyond time and space, and makes us think of connected things. I saw this for the first time myself last year at a festival in Zushi that I attended while I was researching festivals. The act was used as part of the ritual when the the spirit of the mikoshi portable shrine was returned to its place in the actual shrine. Within the ritual, that act stood out as particularly primitive in nature and left a very strong impression on me. This work was born from my attempts to recreate the act at night. As I studied festivals in Japan, Rumania, and other countries, I was surprised by the diversity of the beliefs, prayers, and customs of each region. The other aspect of this I found fascinating was that while an outsider would feel that these things were strange, they were givens that had always existed to the local people. That difference is not a barrier. Rather, there is fascination in the infinite dispersal thereof throughout the world. This book depicts the indigenous festivals, rituals, and customs of my home countries of Japan and Rumania. Festivals are moments in which the past and the future, and the visible and invisible world, connect. 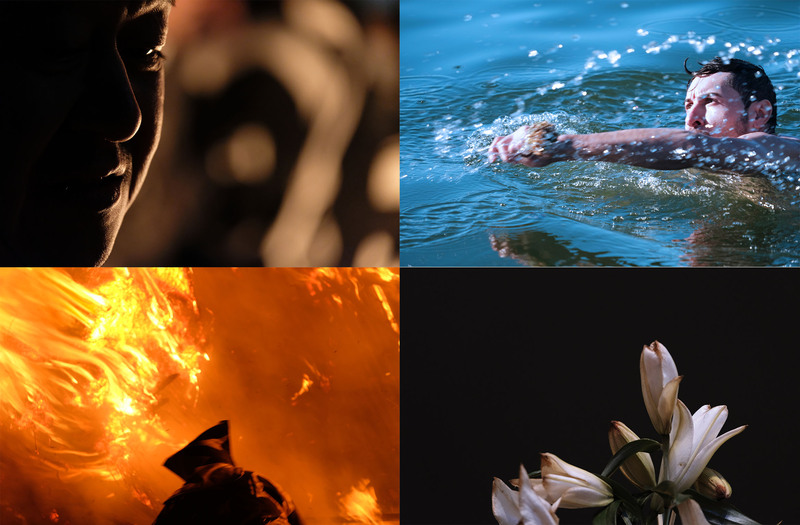 Water and fire festivals can be seen in many different countries. Festivals also clearly show the differences in land and ethnicity. However, if waterside festivals in Japan and Rumania are viewed continuously, it becomes difficult to tell them apart. The book shows the way in which ethnic differences and the similarities of all peoples roll like waves. This installation project that was begun in Turkey was exhibited at the Zushi Art Festival in 2015 after two years of work. 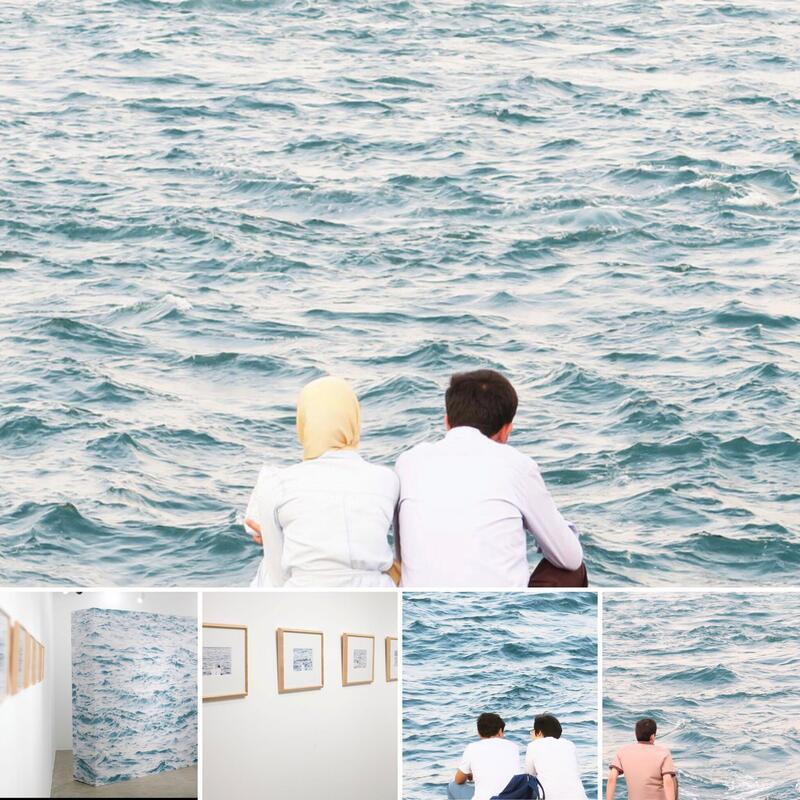 The photographs on the wall are a random collection of actual photographs of the sea in Zushi and Istanbul, and photographs taken by attendees as they stood in front of this “sea wall” in the gallery. In order to tell the two apart, one must look at the background. Thinking of the back side behind things is an important act for making a connection. The sea serves both to inhibit travel by people, but also to connect people with many things that arrive on beaches after being carried by the currents. The content of each photo taken in the gallery assimilates with that of the others and connect gently across time and space. This project will be continued to feature shorelines throughout the world.